Stink Bug Nation poses after Monday’s game. From left to right: Mason Cox, Lincoln Wurster, Jack Morgan, Daniel Sheyko, Sebastian Phalling, Teddy Johnson, and Braden Hunter. 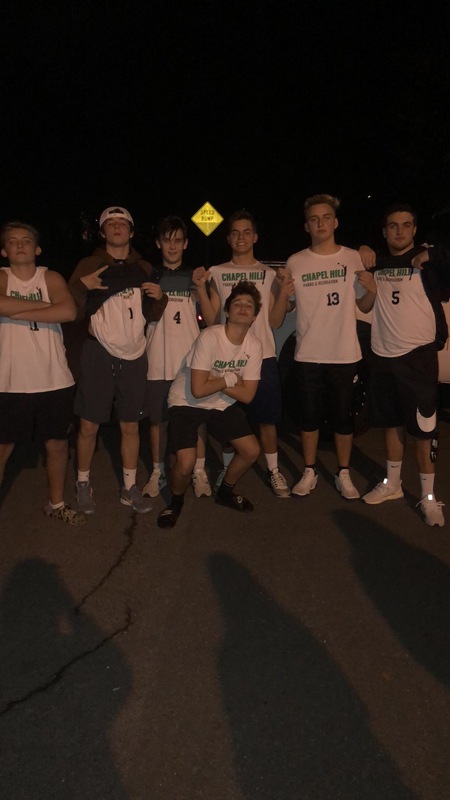 At 9 pm on Monday, January 28, a group of students piled into the Chapel Hill Community Center stands to watch the highly anticipated rematch between two CHS rec basketball teams: the Stink Bugs and Big Baller Brand (BBB). The Stink bugs, featuring sophomore Jack Morgan and junior Teddy Johnson, opened the game with a strong run, jumping out to an early first quarter lead behind sharp shooting by Johnson. Big Baller Brand, led by seniors Serhat Calikoglu and Kevin O’Donnell, fought their way back into the game on the back of Calikoglu, who knocked down three 3-pointers. From the second quarter on however, it was the Jack Morgan show. Morgan got the basket at will, using an array of dribble moves to get through the BBB 2-3 zone, which many times resulted in Morgan shooting free throws. “It was a big game, so I had to take it over to win. After getting blown out the first time we played, we couldn’t get embarrassed again,” said Morgan regarding his aggressive tactics in last night’s contest. He finished the game with 30 of his team’s 43 points. Morgan is a starting shooting guard for the Carrboro junior varsity team, but enjoys rec basketball games more. “These games are way easier than school. Driving [to the basket] is much easier for me and I can get creative. In school I try to be more of a spot up shooter,” said Morgan. While Stink Bug nation celebrated their seemingly easy win last night, BBB star Serhat Calikoglu believes the game could’ve gone much differently if he wasn’t ejected early in the 3rd quarter. “Unfortunately the referees tried to make themselves bigger than the game. Had I been allowed to play the rest of the game it would’ve been a different outcome because everyone knows Jack Morgan can’t guard me,” said Calikoglu. Calikoglu finished with 11 points in nine minutes of play. Members of both rec teams are looking to add new members to their clubs for the summer season, recruiting across all CHS grades.